Dollywaggon Pike sits at the southern end of the Helvellyn range, overlooking Grisedale Tarn. Like most of the fells in the range it has a dramatic craggy eastern face and a smooth grassy western face. Nethermost Pike, Dollywaggon Pike and Helvellyn all have a long sharp eastern ridge that runs away from the summit area. Striding Edge on Helvellyn is the most famous and the most dramatic of the ridges, but Dollywaggon Pike can boast the most dramatically located of the summits, with a tiny patch of level ground jutting from the main ridge, with steep drops to the north and south and The Tongue to the east. The summit of Dollywaggon Pike is hidden for most of the way up Grisedale - the lower crags at Spout Crag, Falcon Crag and Tarn Crag dominate the view for most of the way up the valley, and the true summit only comes into view late in the day. Most people who climb Dollywaggon Pike visit it on their way to or from Helvellyn. The main path runs along the ridge, starting at Grisedale Tarn (either up a zigzag route from the eastern end of the tarn or straight up from just to the west of the tarn). This path then runs along the ridge all the way to Helvellyn, but it skips the summit of Dollywaggon Pike, so you have to divert to the east to reach the top. Grisedale Tarn itself can be reached from three directions - from the east up Grisedale, from the west up the valley of Raise Back or from the south up two alternative paths in the valley between Seat Sandal and Fairfield. Our ascent of Helvellyn from Grisedale, returning via Glenridding, also visits Dollywaggon Pike on the way. Dollywaggon Pike differs from the rest of the range - Helvellyn and Nethermost Pike both have large flat summit areas, but Dollywaggon Pike stays steep to the very top, and the final summit sits on a spur sticking out above the cliffs on the eastern flank of the fell. As a result this is a rather alarming place, but with spectacular views, both north towards the rest of the Helvellyn range and east down Grisedale. A nameless beck that flows out of Ruthwaite Cove forms the north-eastern boundary of the fell, facing Nethermost Pike. 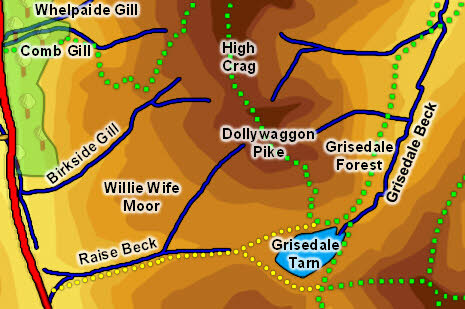 This merges with Grisedale Beck just below Spout Crag, limited Dollywaggon Pike's area in the east. On the western side of the fell Birkside Gill forms the northern boundary and Raise Beck the southern boundary. Both of these becks run west into Dunmail Raise, with Raise Beck turning south to flow into Grasmere and Birkside Gill heading north towards Thirlmere. Dollywaggon Pike looms to the north of Grisedale Tarn, in a valley that forms the gap between the Helvellyn and Fairfield ranges.